Bienvenido a Bohemia - un pequeño pedazo de Europa en la hermosa costa oriental rural de Maryland. Con una gran 600 pies camino circular, Bohemia se encuentra en 20 acres muy privados (8 abiertas y 12 arboladas) que respaldan a la cabeza de la pequeña Bohemia con numerosos senderos para caminar. Ubicado en los terrenos de Worsell Manor, Bohemia es el lugar perfecto para usted y su familia, amigos y seres queridos para conseguir lejos de todo. Con tres habitaciones, dos baños y medio, un fabuloso porche y una piscina extremadamente privada para los huéspedes de Bohemia, solo hay un montón de espacio para que todos se estiren y se relajen durante su estancia. Cocina nueva en el invierno de 2019 - ¡fotos pronto! Nos reservar con frecuencia para eventos en Worsell Manor y el granero, otras bodas locales, reuniones familiares, excursiones en bicicleta, despedidas de soltera, viajes muchachas, individuos escapadas, caza y pesca aventuras, duchas, retiros de parejas y familias que sólo buscan salir de la ciudad . Venga a explorar lo mejor de la costa oriental de Maryland y la experiencia de Bohemia por ti mismo. The house in Warwick is in a nice quiet location near Middletown, DE. Roomy enough to hold a family and grandparents for special events at St. Andrew's School. We really enjoyed our stay at Bohemia Cottage. It was a peaceful getaway in a lovely setting. The screened in porch was a wonderful place to relax in addition to the spacious living room and dining room. And the kitchen was fantastic for cooking and hanging out with family and friends. The beds were super comfortable - well the whole house was comfortable and great for relaxing and getting away from hectic lives. The decor is perfect for the home - lots of interesting wall hangings giving the house a lot of character. And the nearby trails are great for taking lovely walks outside. We highly recommend it! We booked this for a much needed getaway from the city. 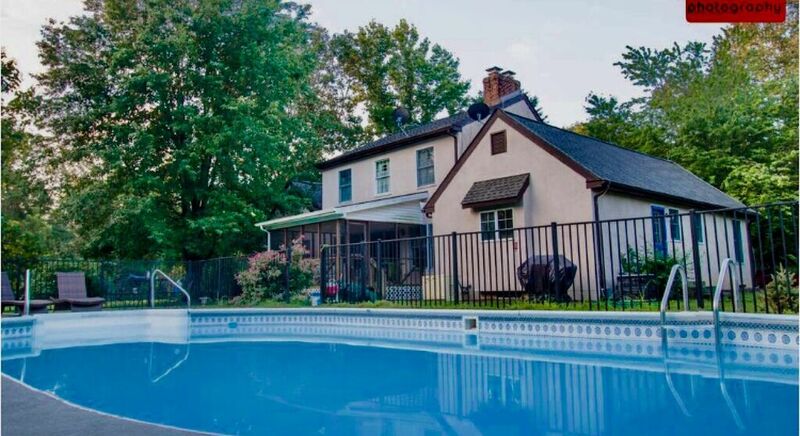 Luckily two of our closest couple friends could join so it made sense to find a big house ..... With a fantastic pool ! The location is totally private and the grounds are beautiful and well kept. We had breakfast and coffee on the screened in porch every morning then hung out by the pool all after noon . Two nights we went into Chesapeake City for dinner ....I highly recommend Schaefers canal house and the Chesapeake Inn. Two great seafood dinners at both. The house itself is very large and spacious with a large open kitchen and sitting area decorated with cool antiques - The master even had a bidet . This property was better than expected and I highly recommend it to anyone looking for an actual getaway from crowds , traffic and the everyday doldrums. We will 100 % without a doubt be back - thank you for sharing your home . Many great memories were made ! One too - get your groceries at the Wal-Mart superstore in Middletown on your way in . Close and a huge selection . We had a great long weekend stay with some friends and small kids. The house was very comfortable and the area was very nice and private. The house had plenty of space for the kids to play and run around outside. The kids loved the pool, it was the highlight of the trip. It was nice that it was gated and a great depth with small toddlers. Would have loved more shade around the pool area but the umbrella was fine for our group. Great place to stay if you want some privacy and spend some quiet time with friends or family.